Professor Rhodes H. Makundi was born on 24th October 1954 in Kilimanjaro Region, Tanzania. He had his undergraduate studies at the University of Dar es Salaam where he obtained a Bachelor of Science in Zoology, Botany, and Education in 1979. He joined the Faculty of Agriculture at the University of Newcastle upon Tyne (UK) in 1981 and graduated with a Masters degree in Applied Entomology in 1983. In 1992 he joined the University of Newcastle (UK) for a Ph.D. graduating in 1996. He worked for the Ministry of Agriculture (Tanzania) as a Research Officer from 1980 to 1987. He has been employed by Sokoine University of Agriculture since 1987, with the current position of Research Professor. His main research interests are pest ecology and pest management technologies. In the last 20 years, he has conducted intensive research on rodents focusing on their zoo-geographical distribution, ecology, disease transmission, and ecologically-based rodent pest management. He has published more than 130 articles being papers in international peer-reviewed journals and book chapters. Insects pest ecology and management. Capacity building in rodent research: Ecology, biodiversity and taxonomy of the rodent fauna of Tanzania. Funded by the Belgian Government through the SUA VLIR Programme (1998 – 2007). STAPLERAT Project: Protecting staple crops in eastern Africa: integrated approaches for ecologically based field rodent pest management. INCO-DC contract number ICA4-CT-2000-30029 (European Union Funded) (2000 – 2003). FOCAL-PANTIL Project: “Development of improved storage strategies, dissemination and integration with indigenous knowledge/practices to reduce post-harvest losses of cereals and pulses due to pests” (Funded by The FOCAL/PANTIL Programme, SUA (2003 – 2007). Research Initiative Programme Project: Spatial and temporal prevalence of rodent-borne zoonotic diseases affecting public health in the Rift Valley in Tanzania (Funded by the Belgian Government through the IUC-RIP programme) (2008 – 2012). StopRats: Sustainable Technology to Overcome Pest Rodents in Africa Through Science (Funded by EU-ACP Science and Technology Programme) (2014 – 2017). Rodent Outbreak Management to Improve Livelihoods of African Farmers (Funded by Agriculture Technology Innovation and Transfer/DFID – United Kingdom) (2014 – 2016). New Research Project Applied for: IMPROVE COMPETITIVENESS AND INCREASE POST-HARVEST VALUE CHAIN OF SMALLHOLDERS FARMERS IN TANZANIA (European Union) – 2016. AFRICAN CENTER OF EXCELLENCE IN INNOVATIVE RODENT PEST MANAGEMENT AND BIOSENSOR TECHNOLOGY DEVELOPMENT (World Bank) MANAGEMENT – 2016. Sabuni, C.A., N.Van Houtte, S. Gryseels, L.S. Maganga, R.H.Makundi, H, Leirs and J. Gouy de Bellocq. Benny Borremans, Jonas Reijniers, Nelika K. Hughes, Stephanie S. Godfrey, Sophie Gryseels, Rhodes H.
Makundi Rhodes H., Apia W. Massawe, Benny Borremans, Anne Laudisoit a Abdul Katakweba (2015). We are connected: Flea-host association networks in the plague outbreak focus in the Rift Valley, northern Tanzania. Wildlife Research 42, 196–206. Christopher A. Sabuni, Vincent Sluydts, Loth S. Mulungu, Samwel S. Maganga, Rhodes H. Makundi and Herwig Leirs 2015. Distribution and ecology of lesser pouched rat, Beamys hindei, in Tanzanian coastal forests. Integrative Zoology 10: 409–423 DOI: 10.1111/1749-4877.12159. 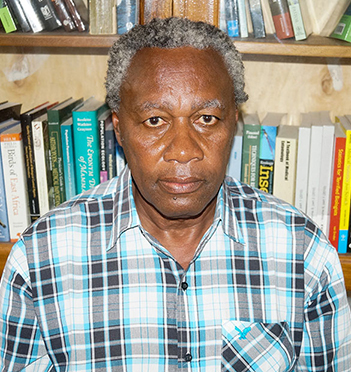 M. Mdangi , L.S. Mulungu , A.W. Massawe , S.J. Eiseb , V. Tutjavi , F. Kirsten , T. Mahlaba , P.Malebane , E. von Maltitz , A. · Taylor Peter J., Sarah Downs F., Ara Monadjem, Seth J. Eiseb, Loth S. Mulungu, Apia W.
Castiglia, R., E. Solano, R. H. Makundi, J. Hulselmans, E. Verheyen, and P. Colangelo. 2012. Rapid chromosomal evolution in the mesic four-striped grass rat Rhabdomys dilectus (Rodentia, Muridae) evaluated by mtDNA phylogeographic analysis. Journal of Zoological Systematics and Evolutionary Research 50(2): 165-172. Gundi Vijay A.K.B., Michael Y. Kosoy, Rhodes H. Makundi, and Anne Laudisoit 2012. Identification of Diverse Bartonella Genotypes among Small Mammals from Democratic Republic of Congo and Tanzania. American Journal of Tropical Medicine & Hygiene 87(2): 319-326. · · Borremans Benny, Herwig Leirs, Stephan Günther, Rhodes Makundi and Joëlle Goüy de Bellocq (2011). Presence of Mopeia Virus, an African arenavirus, related to biotope and individual rodent host characteristics; implications for virus transmission. Vector-Borne and Zoonotic Diseases 11(8): 1125-1131. · Makundi R.H.A. Katakweba, A.W. Massawe, P. Thullier, C.D. Mwalimu, G. Mgode and G. Mchau 2011. Field Evaluation of a rapid diagnostic test using dipstick assay for retrospective confirmation of plague infection in humans in Mbulu District, Tanzania. Journal of Medicine and Medical Sciences (Accepted; IN PRESS). Makundi Rhodes H. and Apia W. Massawe. 2011. Ecologically-based rodent management in Africa: Potential and Challenges. Christiane Denys, Aude Lalis, Émilie Lecompte, Raphaël Cornette, Sibyle Moulin, Rhodes H. Makundi, Robert S. Machang'u, Vitaly Volobouev and Vladimir M. Aniskine 2011. A faunal survey in Kingu Pira (south Tanzania), with new karyotypes of several small mammals and the description of a new Murid species (Mammalia, Rodentia). Zoosystema, 33(1):5-47. Massawe, A.W, Mulungu, L.S, Makundi, R.H, Dlamini, N., Eiseb. S., Kirsten, F., Mahlaba, T., Malebane, P., von Maltitz, E., , Monadjem. A., Taylor, P., Tutjavi, V., and Steven R. Belmain. 2011. Spatial and temporal population dynamics of rodents in three geographically different regions in Africa: Implication for ecologically- based rodent management. African Zoology 46(2): 393-405. Mulungu, Loth S., Apia W.
species, Mastomys natalensis and Gerbilliscus vicinus, in fallow land habitats in central Tanzania. different habitats and seasons in Tanzania and Swaziland. Wildlife Research 38(7): 640-646.
of Biological Science 11(1): 22-30.
management from the highlands of Tigray, Northern Ethiopia. Crop Protection 29(6)): 532-539. Leirs (2010). Sympatric occurrence of three arenaviruses in Morogoro, Tanzania. M. Mwatawala, A. Maerere, M. De Meyer (2010). latifirons, a New Invasive Tephritid Species in Tanzania. Journal of Economic Entomology 103(1):70-76. Lausdisoit, A., Neerinckx, S., Makundi, R.H., Leirs H. and Krasnov B.
M.W. Mwatawala, M. De Meyer, R.H. Makundi, and A.P. Maerere 2009. Tanzania. African Journal of Ecology 48: 313-320. Tanzania. Current Zoology 55(3): 200-211. Maulid W., Marc De Meyer, Rhodes H. Makundi and Amon P. Maerere (2009). Tephritidae) in Tanzania. Fruits. Fruits . Journal of Ecology 45(3): 293-301. LAUDISOIT Anne, Herwig LEIRS, Rhodes H. MAKUNDI, Stefan Van Dongen, Stephen Davis, Simon Neerinckx, Jozef Deckers and Roland LIBOIS (2007). Plague and the human flea, Tanzania. Emerging Infectious Diseases 13(5):687-693. Massawe A.W., Mrosso, F. P., Makundi R.H. and L.S. Mulungu. (2007). for estimating damage to maize caused by rodents. Integrative Zoology 2: 131-135.
unguiculatus L.) grains using botanicals. Asian Journal of Plant Sciences 5(1): 91-97.
of Zoological Systematics 44 (3): 223 – 235.
zones of the Morogoro Region, Tanzania. Fruits 61 (5) 1 – 22.
human plague at a persistent focus in Tanzania. Acta Tropica. 100: 133-1411. R.H. Makundi, B. Pallangyo, F. Schulthess, N. Jiang and C.O. Omwega (2006). Soceiete Entomologique de France 42(3-4): 487-494. Lecompte, Raphaël Cornette, Sybille Moulin, Robert S.
(Rodentia: Gerbellinae) in Africa. Molecular Phylogentics and Evolution. of Zoology 135. (Supplement): 159-165. Kenya, Tanzania and Zambia. Belgian Journal of Zoology (Supplement). in Tanzania. Belgian Journal of Zoology (Supplement). 135: 183- 185. (Supplement). 135: 179 – 181. Journal of Zoology (Supplement). 135: 113-118. 242 – 245. In: G. R. Singleton, L. A. Hinds, C.
International Agricultural Research, Canberra, 564 p. ISBN 186320 356 7.
rodent-density-damage function in maize fields at an early growth stage. pp. 301 – 303. In: G. R. Singleton, L. A. Hinds, C. J. Krebs & D. M.
Agricultural Research, Canberra, 564 p. ISBN 186320 356 7.
maize-seed depredation by the multimammate rat, Mastomys natalensis, in Tanzania. Pp 260 – 261.In: G. R. Singleton, L. A. Hinds, C. J. Krebs & D. M. Banwo,O.O., Makundi, R.H., Abdallah, R.S and Mbapila, J.C. (2001). Phytopathologica et Entomologica Hungarica 36 (1-2): 189 – 192. O.O., Makundi, R.H., Abdallah, R.S. Sciences Vol 29 (1): 61-65.
deterrence and effects on predatory mites, Phytoseiulus persimilis. Archives of Phytopathology and Plant Protection. Vol 34: pp 265-273.
fauna of Tanzania: a cytotaxonomic report from the Maasai Steppe. Rend Mat. Acc. Lincei.- Zoologia 12: 29-49. Wang (Eds) Rodent Biology and Management. Report no. 45. (ISSBN1 86320 256 0). 146 pp. Makundi, R.H., Kilonzo, B.S. and Sabuni, C.A. (1996). Laboratory evaluation of the efficacy of permethrin impregnated overalls for protection against Xenopsylla cheopis (Siphonaptera: Pulicidae). International Pest Control. Vol 38 (2): 56 – 57. Makundi, R.H. (1995). Annual changes of reproduction in rodents in the Western Usambara Mountains, north- east Tanzania. Journal of African Zoology 109: 15 -21. Makundi, R.H. and Wilkins, R.M. (1995). Observations on variation in susceptibility of some sorghum cultivars to infestation of the seed by the lesser grain borer, Rhizopertha dominica (Fab.) (Coleoptera: Bostrichidae). Med. Fac. Landbouww. Univ. Gent 60/3a: 811 – 817. Applied Entomology 118: 165 – 171. Kilonzo, B.S., Makundi, R.H. and Mbise, T.J. (1992). A decade of plague epidemiology and control in the Western Usambara Mountains, north-east Tanzania. Acta Tropica 50: 323 – 329. Makundi, R.H. (1991). Effectiveness of cyfluthrin dust for control and protection of shelled maize against infestation by Prostephanus truncatus (Horn) (Coleoptera: Bostrichidae) in Tanzania. International Journal of Pest Management 37(3): 218 – 220. Makundi, R.H., Mbise, T.J. and Kilonzo, B.S. (1991). Observations on the role of rodents in crop losses in Tanzania and control strategies. Beitrage zur Tropischen Landwirtschaft und Veterinarmedizin (Journal of Tropical Agriculture and Veterinary Science) 29(4): 465 – 474. Makundi, R.H. and Kilonzo, B.S. (1990). Activity of synergized pyrethrins against fleas: Xenopyslla brasiliensis, Xenopsylla cheopis and Ctenocephalides felis (Siphonaptera: Pulicidae) in the laboratory. Pyrethrum Post 18(1): 3-6. Makundi, R.H. (1989). Preliminary observations on the effect of pyrethrins on Prostephanus truncatus (Horn) (Coleoptera: Bostrichidae). Pyrethrum Post 17 (3): 95 – 97. Makundi, R.H. (1987). The spread of Prostephanus truncatus (Horn) (Coleoptera: Bostrichidae) in Africa and Measures for its Control. FAO Plant Protection Bulletin 35 (4): 121 – 126. Makundi, R.H. (1986). The Toxicity of Deltamethrin and Cyfluthrin to the Larger Grain Borer, Prostephanus truncatus (Horn) (Coleoptera : Bostrichidae). International Pest Control 28 (3): 79 – 81. (Horn) (Coleoptera : Bostrichidae). African Journal of Plant Protection 3 (2): 112- 120. Makundi, R.H. (1983). Rodent Pest Problems and Control strategies in Tanzania. Tanzania Veterinary Bulletin 5 (2): 27 – 29. 2.Makundi R.H. 2006. Challenges in Pest Management in Agriculture: African and Global Perspectives. pp. 1 – 18. In: Makundi R.H. (Ed.) 2006. Management of Selected Crop Pests in Tanzania. Tanzania Publishing House Ltd., Dar es Salaam. (ISBN 99761 0210 0). 487 p.
3. R.H. Makundi, F.P. Mrosso and A.W. Massawe 2006. Sorghum: The Crop, the Pests and Their Management – pp. 33 –47. In: Makundi R.H. (Ed.) 2006. Management of Selected Crop Pests in Tanzania. Tanzania Publishing House Ltd., Dar es Salaam. (ISBN 9976 1 0210 0). 487 p.
4. Mrosso, F.P. and Makundi R.H. 2006. Field Pests of Maize and their Management- pp. 48 – 65. In: Makundi R.H. (Ed.) 2006. Management of Selected Crop Pests in Tanzania. Tanzania Publishing House Ltd., Dar es Salaam. (ISBN 9976 10210 0). 487 p.
5. Makundi R.H., A.W. Massawe and H.S. Laswai 2006. Storage and Protection of Durable Food Crops and Their Products in Tanzania – pp 186 – 205. In: Makundi R.H. (Ed.) 2006. Management of Selected Crop Pests in Tanzania. Tanzania Publishing House Ltd., Dar es Salaam. (487 p). 6. Makundi, R.H., B.E.M.A. Uronu and W. Mbise 2006. Biology, Ecology and Management of Infestations of the Larger Grain Borer, Prostephanus truncatus (Horn), in Tanzania – pp 206 – 220. In: Makundi R.H. (Ed.) 2006. Management of Selected Crop Pests in Tanzania. Tanzania Publishing House Ltd.,Dar es Salaam. (ISBN 9976 10210 0). 487 p.
8.A.W. Massawe, R.H. Makundi, V. Ngowo and L.S. Mulungu 2006. Vertebrate Pests and Their Management: A General Overview – pp 237 – 248. In: Makundi R.H. (Ed.) 2006. Management of Selected Crop Pests in Tanzania. Tanzania Publishing House Ltd., Dar es Salaam. (ISBN 9976 1 0210 0). 487 p.
9. Mulungu, L. S., Makundi, R. H. & Massawe, A. W. 2006. Characteristics of rodent damage to major crops in Tanzania and crop loss assessment techniques – pp 249 – 268. In: Makundi R.H. (Ed.) 2006. Management of Selected Crop Pests in Tanzania. Tanzania Publishing House Ltd., Dar es Salaam. (ISBN 9976 1 02100). 487 p.
11. Makundi Rhodes (2018) Neglected and underutilized rodents. Pp 91-117. In. Kasolo W., Chemining’wa G. & Temu A. (Eds.) Neglected and Underutilized Species (NUS) for Improved Food Security and Resilience to Climate Change. A Contextualized Learning Manual for African Colleges and Universities. ANAFE, Nairobi. (151 p. (ISBN 978-9966-108-10-4.
viumbe waharibifu wa mazao ghalani. Chapisho namba FOCAL 4 – 2005. Inaugural Lecture: Makundi R.H. (2009) The Mysteries of the Rats. Sokoine University of Agriculture, 25th November 2009. 49p. Ngowo Victoria, Massawe Apia, W. and Mshuza Eustace 2010. Community-Based Rodent Management in Kilimanjaro Region, Tanzania. Consultancy Reports. Belgian Technical Cooperation/ Ministry of Agriculture, Food Security and Cooperatives. Tanzania. 99 pp. 2. Anna Samwel (BSc. Agriculture General) Title: Effect of Tephrosia vogelli on feed intake and body weight of white mice. 3. Kessy, Radegunda, F.I. (BSc. Agriculture General). Title: The efficacy of paddy husk ash against the larger grain borer (Prostephanus truncatus) and maize weevils (Sitophilus zeamais) in maize grains. 4. Lugeimamu Amon. (BSc Agriculture). Title: Assessment of invertebrates diversity in cultivated and non cultivated areas at SUA. 2. Nyabilisi Maliyatabu Ng'homa: Title of Dissertation: Effectiveness of four botanical extracts for control of American Bollworm (Helicoverpa armigera) (Hubner) and cotton aphids (Aphis gossypii) (Glover) on cotton in Mwanza region. 4. Kamwela, D.S. : Title of Dissertation: The response of the larger grain borer (Prostephanus truncatus) (Horn) to varietal resistance in maize. 5. Mwinyi, W.A. : Title of Dissertation:Control of Cashew sucking bugs (Helopeltis anacardii, H. schoutedeni and Pseudotheraptus wayi by manipulating weaver ants, Oecophylla longinoda, populations in cashew nut trees. 6. Sariah, J.E. : Title of Dissertation: Influence of sowing time of Beans (Phaseolus vulgaris) on level of infestation and parasitism of the bean stem maggot (Ophiomyia spp.). 7. Haule, John Bosco. : Title of Dissertation: The effect of extracts of neem seed on survival and infestation of Thrips tabaci on onions. 8. Mrosso, F.P. : Title of Dissertation: Reproduction and population dynamics of Arvicanthis niloticus (Desmarest 1822) in Kilosa District, Tanzania. 9. Mgoo, Victor. : Title of dissertation: Maize yield losses attributed to the Stem Borer Chilo partelus (Swinhoe)(Lepidoptera: Cerambidae) in Eastern agro ecological zone of Tanzania. 10. Nassoro Abdulla. : Title: Species and distribution of egg parasitoids of maize stem borers in Morogoro and Coast regions in Tanzania. 12 Sabuni C.S. Title: Species composition and diversity of small mammals in the Saadani National Park, Tanzania. 15.Mziray, Henry, A. Title: Incidence, host utilization and seasonality of Solanum fruit fly, Bactocera latifrons (Hendel) (Diptera: Tephritidae) in Morogoro,Tanzania. 16.Muhidin Mabula Title: Host range and population dynamics of cotton strainers, Dysdercus spp. in Kilosa District,Tanzania. 17.Kongola E. Title: Movements and home range of rodents in domestic and peridomestic areas in Berega village, Morogoro, Tanzania. 19. Ginethon Mhamphi. Title: “Laboratory evaluation of effects of quinestrol nd levonorgestrel on fertility and reproductive performance of multimammate rats, Mastomys natalensis”. 20. Zacharia Joseph Mseswa. Species diversity of small mammals in Mamiwa – Kisara North in Kilosa District, Tanzania. 2. Mulungu, L.S. Title of thesis: Assessment of maize (Zea mais L.) damage and yield loss due to the multi-mammate rats, Mastomys natalensis (Smith, 1834) in the field. 3. Richard O. Odhiambo. Title of thesis: Community structure and diet preference of rodent pests of maize (Zea mais L.) in central and southwestern Tanzania. 4. Mwatawala, Maulid. Title of Research Project: Host range, population dynamics and damage of fruits by fruit flies i Morogoro Region, Tanzania. 6. Christopher Sabuni. Population ecology of Rhynchocyon petersi and Beamys hindei in selected coastal forests in and around Saadani National Park, Tanzania. in Kilimanjaro National Park – Tanzania. and mangabeys, and potential parasite and microorganism transmission between humans and non-human primates in Tanzania. 12. Sisiria Akoth. PhD Title- Diversity and population dynamics of rodents and ectoparasites in Mt Elgon Ecosystems Uganda.